Sir Paul McCartney famously provided the theme song "Hope For the Future" for Bungie's Destiny in preparations for the game's release, and now he has just released what has to be the laziest music video on the face of the Earth through Wired. How is it lazy? Well, let's just say that Bungie just needed to choreograph a few minutes of Destiny footage, using a handful of character models to make it look like the Guardians are down on their luck and need the vocal chords of an aging British pop-star to perk them up. Seriously, look just how miserable all of them are. Must have spent one too many countless hour grinding away at a loot cave somewhere. 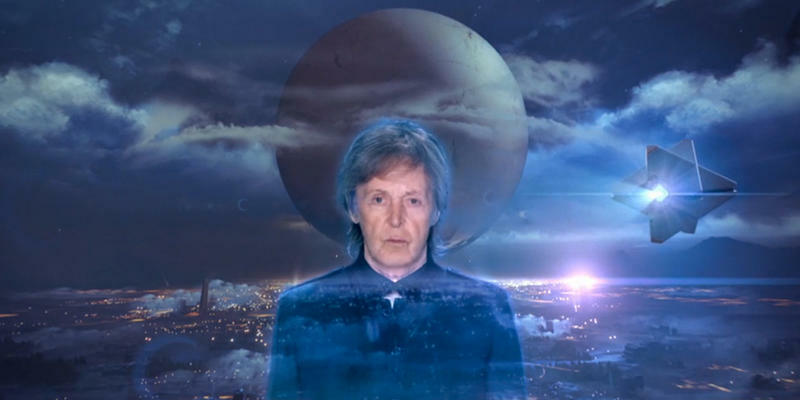 Luckily for these sad Guardians, McCartney spent an hour of a lazy Sunday afternoon singing "Hope For the Future" in front of a green screen for a few takes, and everyone's favorite floating sidekick, Ghost, is now able to project him into every corner of Destiny's expansive canon. All across the Solar System, our protagonists gaze in wonder at this man as he soothes their soul with the power of music. Why am I kind of down on this video? Well, one, it really is just video game footage with a pop star projected onto it. And two, for all the millions of dollars Activision probably had to spend to get Sir McCartney into the recording booth, it fails to meet the standards set by truly emotional music videos created before for video games. Seriously, compare this to the opening to Wild ARMs. Both are rife with similar images of starry skies and adventurers scattered among the rocks, and their songs both tackle themes of loneliness and hope for a better future. Wild ARMs' just happens to do it without lyrics. Sorry, but I'm not sure there is much of a comparison. We don't need outside celebrities to make our video game culture great. We don't need Paul McCartney writing Destiny's music anymore than we need Jack Bauer voicing Big Boss in Metal Gear Solid. We already have a vast and rich history of musicians, animators, writers, actors, singers, and artists who are capable of taking gaming to great heights without the fame needed for marketing teams. Selling this out to popular faces looking to make a quick buck on this booming industry is just another step in the wrong direction. Unless Paul McCartney has a deep passion for the lore of Destiny, then I am just totally mistaken. Let games succeed by letting it come into its own, rather than letting the outside world force it too quickly. Otherwise, it's kind of pointless.